This new mount was designed to utilise the Hobby King HK15139 waterproof Servo Motor with the express desire to offer a mount which could be used on garden layouts. 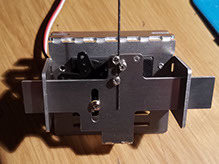 Other larger Servo Motors like the Futaba S3003 will also fit. It is quite a large mount due to the size of the Servo Motor, but still offers the same linear motion that our other mounts provide. The mount can be top mounted or mounted under the baseboard. Although switches will probably not be used on this mount it does have provision to mount up to 4 switches for getting signals from the servo position. Because the standard microswitches only have a capacity of 1 amp, we suggest that they be used to operate a relay to provide heavier current options. 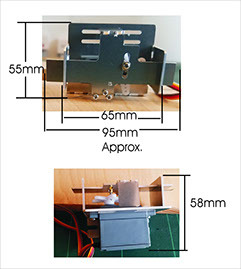 Switches can be provided with the kit if requested - please specify when ordering. The picture below shows the comparison between our Low Profile and this new HD Mount.